Hats off to Terk for building an indoor antenna that can blend into a room's decor. 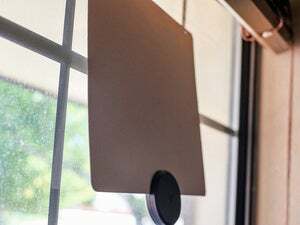 In a market where looking good in the living room doesn’t seem to be on the list of design priorities, Terk looks to start a new trend with its Horizon indoor amplified antenna available at Best Buy for $40). 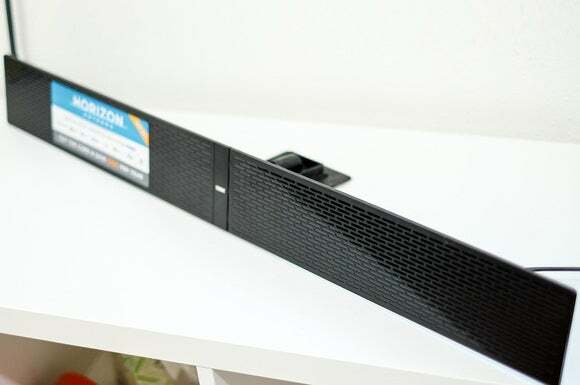 Instead of lying flat on your TV stand, or finding itself pinned to a wall or taped in a window, Terk’s Horizon looks more like a sound bar that rests on top of or in front of your TV—it barely looks like an antenna at all. Open the box and you’ll find a customizable stand, a nine-foot coax cable, a power adapter, and a USB power cable in addition to the antenna itself. The included stand snaps into the back of the antenna. 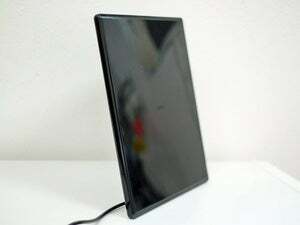 You can stand the antenna in front of your TV, sound-bar-style, or attach it to the top of your TV using an adhesive strip. Alternatively, you can mount the Horizon on a wall using screws (which are not included). I installed the Horizon in front of my TV, connected the power cable to an empty USB port on my television for power, connected the coax cable, and scanned for channels. The Horizon found 22 digital and one analog channel on its first scan (out of a possible 31 channels available in my area). The second scan fared worse, with the antenna bringing in 19 digital channels but not the lone analog channel. A third scan returned the same results, 19 and zero. After some adjusting and fidgeting, a fourth scan returned 2o digital channels and one analog one. Confused by this inconsistency, I decided to remove the USB power cable from my and plug it into the included power adapter. All subsequent scans found 22 digital channels, and yes, the single analog channel. Perhaps my TV’s USB port wasn’t providing enough power for the Horizon’s amp, or some other funky reason was causing the discrepancy. I simply don’t know. Once I was settled in with a consistent channel lineup, I can say nearly all channels came in clear. The further broadcast towers from my home are 41 miles away, and the Horizon claims a 60-mile range. Local stations such as NBC, CBS, ABC, PBS, and Fox all came in clear and in either 1080p or 720p resolution. The Terk Horizon is a stylish amplified antenna that looks more like a small sound bar. It delivers quality digital TV reception, as long as you use a proper power outlet.